Ok, lets me stop the potato vs sweet potato thing and get back to the recipe. 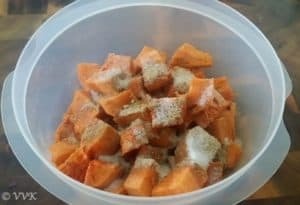 As usual I microwaved the sweet potatoes and removed the peels and cubed them. Before adding it to the pan, I included all the masalas and then roasted them. Finally drizzled some lemon juice and added some chopped cilantro and sev and called it a chaat. That’s it. But you can take this simple chaat to further levels. Either you can add the spiced up yogurt like in dahi sev puri and top it up with sev and pomegranate arils. 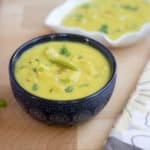 You can add plain yogurt and top it up with both green and sweet chutney and yeah of course with onions, sev and cilantro. Wash the sweet potatoes thoroughly and steam them in your preferred way. I, as usual microwaved them in the potato setting. Let it cool and chop them roughly into cubes. 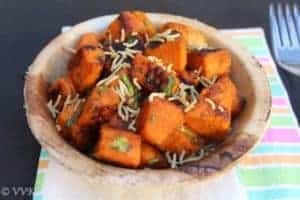 To these boiled sweet potato cubes, add the chaat masala, jal jeera masala, salt and red chilly powder. Toss them nicely and ensure the masalas are coated nicely. Now heat a wide pan or wok and add oil. 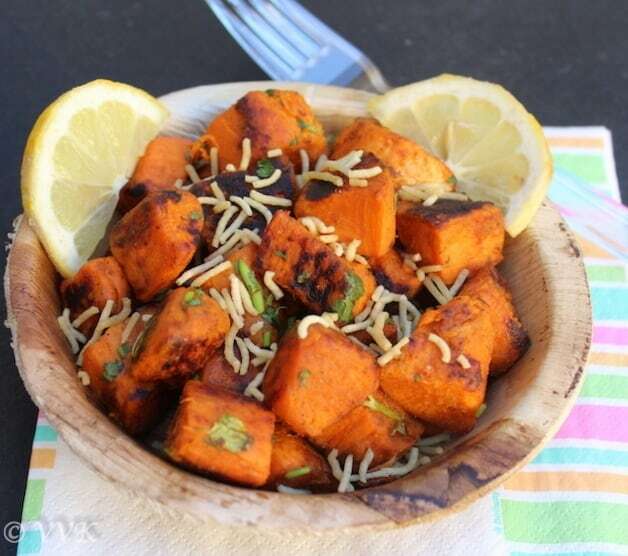 Once the oil is hot, add the masala coated sweet potatoes and in medium flame roast them until they turn brown. I charred them nicely like below. Turn off the heat and transfer to the serving bowl. Now add the lemon juice and garnish it with cilantro and sev. That’s it. Super simple yummy sweet potato chaat is ready. 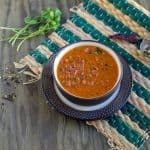 Instead of sweet potatoes, aloo or corn can be used too. Steaming them first and roasting helps in less oil consumption. We prefer charred sweet potatoes, so I usually let them roast for longer time. But you can adjust the cooking time as per your preference. 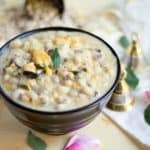 You can garnish this with roasted and crushed peanuts, sev, pomegranate arils and also with sweet chutneys. 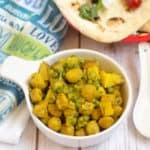 A healthy alternative for fried aloo chaat prepared with sweet potatoes. The sweet potatoes are boiled and cubed and tossed with spices and pan seared until the crust is formed. Serve this with as dash of lemon juice and sev. 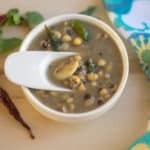 I love these sweet potato chat Srividhya, the last time I made, it was with small quantity and it disappeared in no time!.. I would love with chutneys and lot of sev on top!! mouthwatering chat!!! What a healthy and delicious chaat with sweet potato. 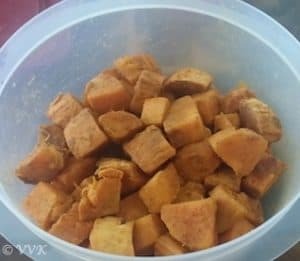 I remember eating sweetened sweet potato cubes as a kid but haven’t tasted the chaat version. It looks inviting. 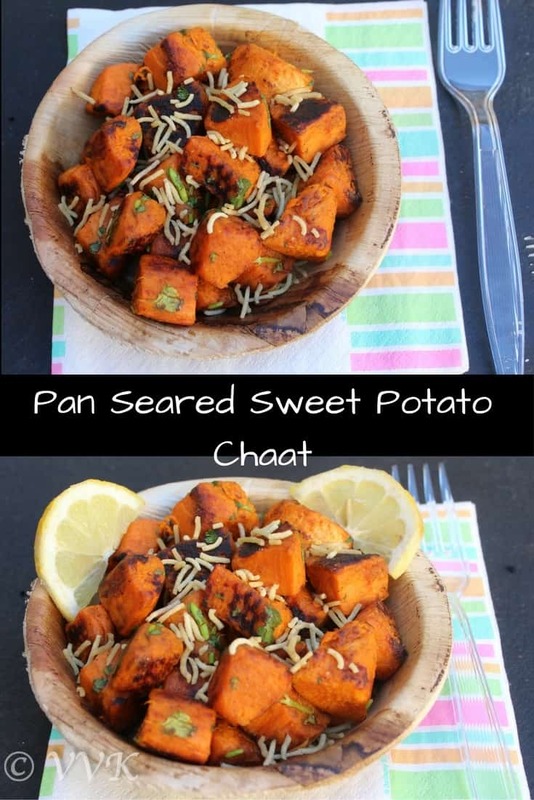 Wow a chaat with sweet potato sounds like an amazing idea! Perfect tea time snack for sure. I too will prefer this sweet potato chaat to aloo chaat. Lovely recipe. what a great recipe. My boys love sweet potatoes and this would be a great way to serve them. 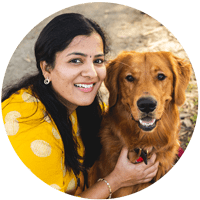 Thanks Kalyani. I can imagine the winters and this chaat during winters. nothing can beat street food. Such a tasty looking chaat bowls.Healthy and tasty. I love sweet potato, but have never tried it in chat form. This looks so yum and a guilt free snack too..
yes.. Thanks and please do try Gayathri. Great.. Please do try it Pradnya. We love this chat , but instead of boiling we roadt it , in fact after boiling , just roast on the fire to get a smoky flavor , the chat is absolutely amazing . Yeah.. it went the other way around. ;-) Thanks Vaishali. Good one. My kids love this. I should try with the spices you used. Nice and guilt free chaat..
Sweet potato chaat is very tempting. I usually boil sweet potato and eat it as is. That’s how we use to eat growing up. This would be a nice variation to that. Thanks for sharing the recipe. I love the plain boiled sweet potato too.. just wanted to try an alternative usha. Thanks much. Its been a while i had this sweet potato chaat, too prefect to munch anytime of the day.